Home / News / Burdett-Coutts Science Week! In conjunction with British Science Week 2016, our school was transformed into a fun-filled, action packed, utterly inspiring scientific discovery zone with many opportunities for the children to work and deepen their scientific knowledge and skills. Held from 14th – 18th of March, this year’s theme was ‘Discovery‘ and involved promoting scientific skills through the concept of ‘Investigate, Explore and Excite‘. Prior to this week, the children were given an opportunity to participate in a creative science experiences led by the Mad Scientist. Not only were the children able to learn from a variety of lively and entertaining science experiments – they even set off the fire alarm!! Day One of Science Week began literally, with a bang, as parents, carers, pupils and staff were greeted on Monday morning by the sight of an enormous rocket in the playground! 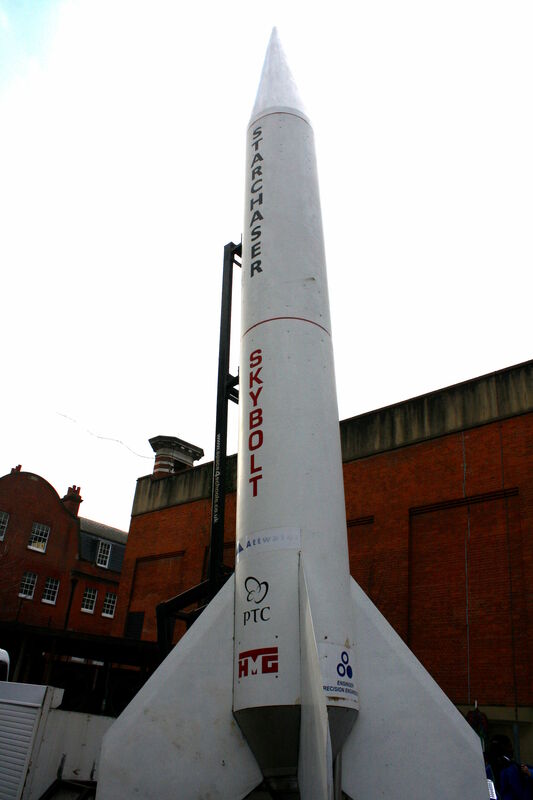 Named Skybolt, the rocket is a scale model of the Starchaser 5 rocket system that will be used for launching manned spacecrafts. Starchaser CEO, adventurer and rocket scientist, Steve Bennett then gave a talk to the children about space travel and what inspires him about rockets and space. The children later built their own rockets and launched them! Day Two saw the children travelling through space to discover the stars and planets via the Astrodome, a mobile planetarium. Presented by Peter Golding, A Trip To Space, a space show with over 18,000 stars projected together with models, music and moving picture views of the planets, took all the children on an imaginary space-flight from Earth to the outer edges of the solar system. On Day Three, we were visited by scientists from Kings College London for an inspiring assembly about the ground breaking work being done in stem cell research. Following this, the scientists led a hands on workshop with experiments and games for the children to participate in. Day Four saw selected pupils from Year 2 to 6 visiting Kings College to work in a laboratory alongside practicing scientists. The children were given a tour of the facilities and also had the opportunity to extract DNA from strawberries! The last day of Science Week culminated in an entertaining and educational assembly by Lewis class. They showcased all the exciting things that took place during Science week, showed interviews with pupils taken and edited on the Ipads and entertained the whole school with their ‘Space Rap‘. It has been an amazing week and the children have thoroughly enjoyed themselves while embracing new and enriching learning experiences. All year groups were able to participate in science based investigations, giving them fantastic opportunities to develop their enquiry skills and to take on the role of scientists working collaboratively. Many thanks to all the staff especially to Mrs Sweeney (Science Leader), Mrs Dyer, Ms Lavinia, Mr Murphy and Mr Martin for all their hard work in organising this amazing week!